Dr. Archer completed his Bachelor’s Degree in Biomedical Engineering from the Rose-Hulman Institute of Technology in 2012, and completed his Ph.D. in Applied Physiology and Kinesiology at the University of Florida in 2016. 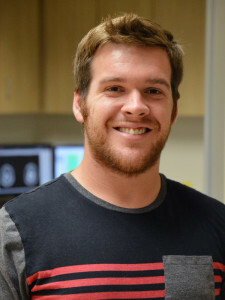 His graduate work was focused on examining the structural and functional deficits in patients with chronic stroke using probabilistic tractography and functional MRI techniques. The focus of his postdoctoral work is to develop algorithms which will streamline diagnosis of Parkinsonism using diffusion MRI. He is also working on a Parkinson’s Foundation Postdoctoral Fellowship, where he will develop a high-resolution white matter template relevant to neurodegeneration. Dr. Archer is interested in developing high-resolution white matter templates which can be provided internationally to researchers and clinicians. He is also interested in applying these templates to neurodegenerative disorders such as Parkinson’s disease and Alzheimer’s disease. Archer, D. B., S. A. Coombes, W. T. Chu, J. W. Chung, R. G. Burciu, M. S. Okun, A. Wagle Shukla, and D. E. Vaillancourt. “A Widespread Visually-Sensitive Functional Network Relates to Symptoms in Essential Tremor.” Brain (Dec 22 2017). Archer, D. B., D. E. Vaillancourt, and S. A. Coombes. “A Template and Probabilistic Atlas of the Human Sensorimotor Tracts Using Diffusion Mri.” Cereb Cortex (Mar 14 2017): 1-15. Archer, D. B., N. Kang, G. Misra, S. Marble, C. Patten, and S. A. Coombes. “Visual Feedback Alters Force Control and Functional Activity in the Visuomotor Network after Stroke.” Neuroimage Clin 17 (2018): 505-17.